Blastrac steel blasting systems are the most effective and environmentally friendly methods of removing paint, coatings, non skid and other contaminants from steel surfaces. Our steel blasters use steel shot and angular steel grit , or a mixture of the two in a variety of sizes allowing the operator to achieve a wide range of anchor profiles needed for almost any type of coating application. Our vertical steel blasting machines are used in conjunction with specially developed Blastrac cone, dome and floating roof rigging systems which are constructed on top of the roof and or floating walkway. These systems are remotely controlled by the operator on the ground floor. These steel blasters can clean the shell sides of steel storage tanks (internal and external) and can be used for blasting ship hulls and other vertical steel surfaces. Horizontal steel blast cleaning machines are used to clean horizontal ship decks, aircraft carrier landing decks, hatch covers and similar horizontal surfaces. Vertical machines are suspended from either a crane or a rigging system and operate in an up or down direction to clean and profile ship hulls, they are remotely controlled from a mobile work station. 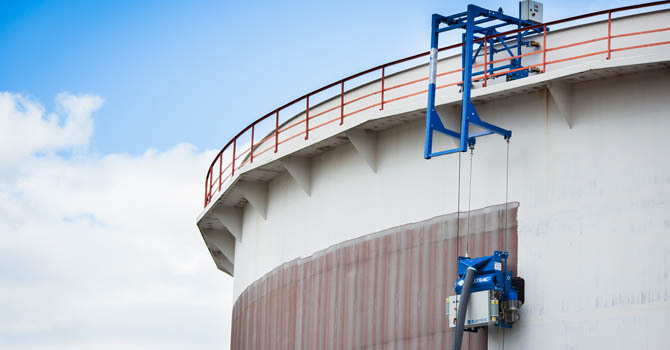 In the petrochemical industry Blastrac steel blast cleaning machines are used as a quick and efficient surface preparation method prior to painting small and large surfaces of storage tanks areas, for example, the internal bottom and the external roofs of oil storage tanks.